Get Ready For Fabrics Galore & Quilting Store’s 4th Annual “Christmas In July” Storewide Sale! It’s Hot! July is a great time to stay cool indoors and start your 2018 Holiday quilting, sewing and craft projects and be inspired by new gift giving ideas. OR, for extra inspiration, a cool change of scenery and meeting new friends, check our class calendar to select one of our fun sewing, crafting, quilting classes scheduled this summer. 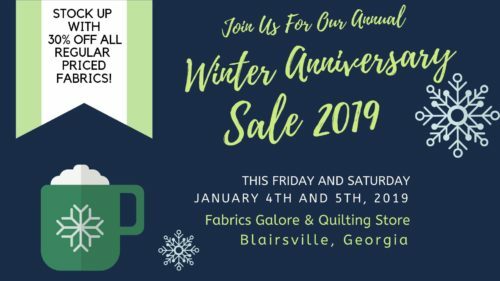 Fabrics Galore & Quilting Store in Blairsville GA is inviting you to celebrate with us! during our 4th Annual CHRISTMAS IN JULY SALE to kickstart those holiday projects you’ve been planning for special friends and family! 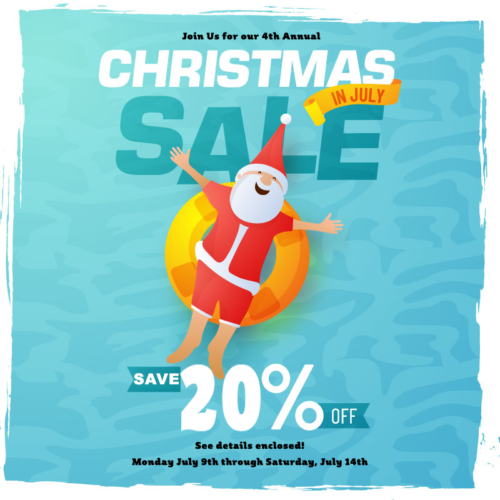 OUR CHRISTMAS IN JULY SALE STARTS SOON! MARK YOUR CALENDARS FOR HOT SAVINGS! during our regular store hours of 10 am to 5 pm Monday through Saturday. 20% OFF ALL regular priced fabrics with minimum one yard cuts. 20% OFF ALL regular priced Notions, Patterns, Books and Threads. YES! We’re rolling out fantastic ways to SAVE on all the materials and supplies you need to get organized and ready for creations you enjoy gifting this 2018 Holiday Season! In addition to our CHRISTMAS IN JULY SALE, Fabrics Galore & Quilting Store will host a two week long SILENT AUCTION! WHEN: Silent Auction begins Monday, July 9th and runs for two weeks through Saturday, July 21st. WHAT: Auction items include various Quilts, Table Runners, Quilt Kits and Bundled Fabrics that will be identified and displayed during the Christmas in July Sale and throughout the 2 week Silent Auction. 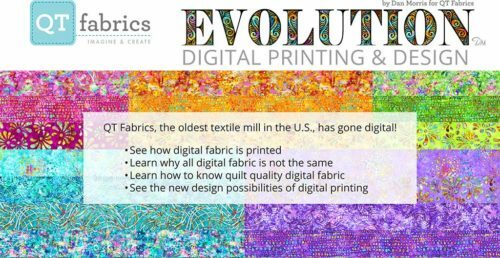 Be sure to check our website for newly posted, upcoming classes at FabricsGaloreandQuiltingStore.com – We’ll be adding new classes to our calendar as an ongoing effort. We look forward to seeing you here at your North Georgia Fabric, Crafts and Quilting Headquarters! Wishing you a safe and very Happy Independence Day holiday week. We will be closed Wednesday, July 4th to enjoy the holiday with family and friends and will reopen July 5th, 6th and 7th for your cool shopping pleasure!